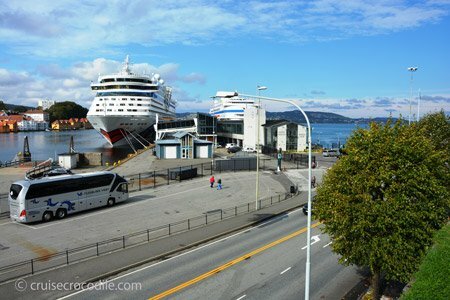 Our Bergen cruise port guide gives information about your ship's docking location, cruise port facilities, transportation options and much more! Read what it is you can do in the wonderfull port of call of Bergen. 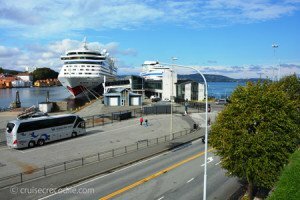 Welcome to the Bergen cruise port guide. Bergen is the 2nd largest city of Norway with 280.000 inhabitants. It is a city build on 7 hills, just like other great cities like Lisbon, Rome, Athens and Istanbul. It is a very important city for Norway, because it is the national centre for higher education, tourism and finance. When you walk though the city centre of Bergen you will notice that there is a story to tell on every single street corner. 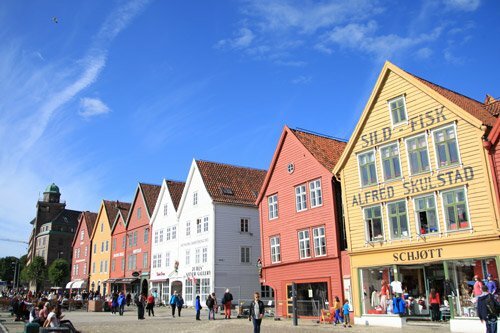 Hear about the fires that destroyed the city centre, about the role Bergen played in the succesful Hanseatic League and the name it had as an international recognized trading city that made it famous throughout Europe. During the middle ages Bergen was the most important city in Norway. It was the largest city, home of the Norwegian king and a town that had mayor trading privileges compared to the rest of the country. Therefore until the 1830’s it was the most important and populous city of Norway until Oslo would finally surpass them. In the city of Bergen you have lots of options on what to see and do, whatever your interest is. Go hiking in the mountains, enjoy the scenery from Mount Floyen, visit the art museums in town or learn about Bergen’s vibrant history. Find out underneath what it is you can see and do in the Bergen Cruise Port Guide. This is one of the docking locations for the cruise ships. Most other cruise docks are located directly next to it. The cruise docks are in front of the old castle grounds and from here it is approximately 1 km / half a mile walk to the city centre. At the cruise dock you will find several facilities like public transport to the city, taxis and the hop on hop of bus. At the cruise port there is no tourist information centre. There are city maps available though. In Bergen cruise ships often dock at the Bontelabo or at Skolten pier. These two cruise docks are right next to each other and both of them are about 1 km / half a mile away from the city centre. 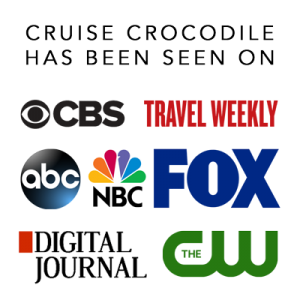 Most ships do not run a shuttle bus, but check with the front office on board your cruise ship if this will be the case for your call. If you want to reach the city centre you can either walk for approximately 1 km, take the hop on hop off bus, take public transport or take a taxi. In a very rare occasion your ship will dock at the other side of town. Click here to be redirected to the Bergen Havn website where you can check where your ship will dock. Remember that the Bontelabo and Skolten pier are the cruise docks described here in this cruise port guide. The Festningskaien is actually nearest to bryggen, but not all cruise ships are able to dock here. If you dock at Jekteviken, you will be able to take the free shuttle bus into the city centre. There are usually a limited amount of taxis available on the cruise dock in Bergen. You will find them on the parking lot where it marks “taxi” on the ground. Keep in mind that taxis are pricy in Norway. Rule of thumb is you usually pay around 700 NOK (+/- 100 USD) per hour. Expect a short ride to the city centre to cost you around 15 euro. There is public transport from the port to the city centre. Any bus coming by the port, going towards the right hand side, goes to the city centre. The bus stop is located on the main road directly at the port. Pay the driver directly in NOK for a ticket. Click here to be forwarded to the Bergen public transportation operator Skyss. There is a hop on hop off bus service available at the port. It is a nice way to get around the city, but keep in mind that also everything is within walking distance. In town, at Bryggen, is where you usually find a trolley train that provides tours through the city centre. Find its departure location on the map above. It is marked with a blue train logo. This is a mansion just outside of Bergen that you might pass. It is the residence of the Norwegian Royal Family. On a sunny day it is nice to visit the gardens and enjoy the beautiful scenery there. The port of Bergen offers several docks for cruise ships. This is the main location. Curious about the other locations? 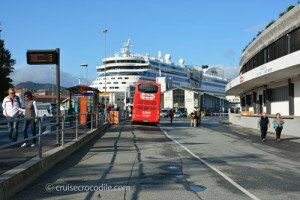 Check out the full Bergen cruise port guide here. This is a MUST see in Bergen. This UNESCO world heritage site is what Bergen is famous for. Get a sense of what this trading city in the medieval times used to be all about. Today there might just be a couple of houses that stand here, but back in the days it used to be hundreds. Make sure not just to stick around on the dock here. Whenever you get the chance to pop into an alley you should go for it, because the neighborhood continues behind these houses. The castle ground lay opposite of the docking locations in Bergen. On this premises you will find the Haakon’s hall, Rosenkrantz tower and many other important historical buildings. All of these building will tell you the story and history of the city of Bergen. Make sure to visit this on your way to the city or back to the ship. In Bergen you never quite know when you are going to run into the cutest neighborhood of all. There are still many areas in the city where you can find the traditional wooden houses. Bergen has a famous fish market where you can basically try anything that the Norwegians get out of the ocean and the fjords. Try anything from king crab to fresh boiled shrimps. It doesn’t stop there because you can also try some very unusual sausages. Have you ever tried elk or reindeer sausage for example? Edvard Grieg is the most famous composer Norway has ever known. He was born and raised in Bergen and although he travelled the world, he always comes back to Bergen. His house is nowadays a museum where you will also find a new auditorium and visitors centre. It is quite a way out of town so plan a visit ahead. You can visit this sight by taking the taxi or the light rail. From the city centre take the light rail tram in direction “Nesttun” and leave the tram on the station “Hop”. Follow sings to “Troldhaugen”for ca. 20 minutes. Or click here to be linked to their website to see when they have their shuttle service running. There are only a handful of stave churches left in Norway. These typical churches from the 11th and 12th century mark a very unusual and intriguing time in history for Norway. Just outside of Bergen there is replica of a stave church you can visit. Simply take the light rail/tram from the city centre and go the outskirts of town to visit. We have marked the tram stop for you in the Bergen Cruise port guide. Ask for directions though, it is still about 1/2 mile walk from the tram stop and there are no signs. Find this very interesting museum about 1 km walk from the dock. It focuses on the history of the Hanseatic League in Norway. The Hanseatic League was basicaly the European Union of its time and for the first time in European history the countries would start to work together rather than work against each other. In this museum you can learn all about life during the Hanseatic League and what made it such an incredible cooperation. Bergen is famous for the 7 hill tops it is build on. Please know any hill just to the north and east of the port is suitable for hiking. You’ll find there are several paths going up the hills from the town area. The most spectacular one has to be the Stolzekleiven. It is one of the steepest hikes in the world and it is loved by locals because this is their work out spot. Join them for a adventurous walk. Find the start marked on the map in the Bergen cruise port guide or ask a local. You need 1,5 hours from the ship to the top and the view will be worth it. One of Bergen’s main attractions is the Fløibanen funicular. Find the lower station right in the center of town. Buy a ticket and hop on the funicular. It will take you up Mt. Floien where you will have an incredible view over the city of Bergen. It is also a great starting point for a hike. There are several recommended hikes on Mt. Floien. We do highly recommend you to buy your tickets in advance through the Floyen.no website. The queue for the Floibanen can be long, especially during summer time with a lot of ships in port. You can buy your ticket on the website and pass the line when you get there. It is only a 10 to 15 minute walk from the Skjolden en Bonelabo cruise dock.